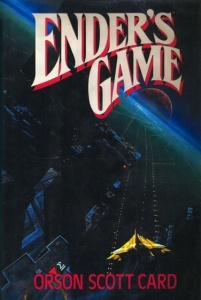 Orson Scott Card’s Ender’s Game has had a massive effect on the Science Fiction genre as well as Modern American Literature. Needless to say, it’s also an exceptionally popular book. It’s been published in tens of languages, it has comics and video games based off of it, and finally, after years and years of waiting, it has been made into a movie. This is the point of this post, to discuss the movie. Now I know what you’re all thinking “But Jeff! This is a blog about books and book reviews! You can’t discuss a movie!!! !” Oh, but my diligent readers, but I can. This is in part because I’m required to by my Multimedia Class a Point Park University in which I use my blog to complete numerous projects. This assignment, which this post will fulfill, is to preview something. What better thing to preview than the movie version of one of my favorite Sci-Fi books which I’ll be seeing very soon.The book Ender’s Game is a very deep and complex book, both in the story as well as into the emotions and character developments that take place inside its many pages. In all honesty I’m quite surprised that the movie has even been made. This is because I’m not entirely sure if you can make a good movie adaptation of the book. So much happens inside of it that how one could really chose what to take out and what to leave in so that the film doesn’t go out of the standard 2 hour format that most films utilize. Based on what I have seen from the trailers it does look rather entertaining. But then again, World War Z looked really good too, but that turned out to a rather poor imitation of the source material. Despite my wariness I do look forward to seeing this movie. After I have seen it, rest assured I shall report back as to my experience.